On January 17, 2017 Mark R. Cuker served as a panelist at a Continuing Legal Education (CLE) event hosted by the Philadelphia Bar Association’s Environmental and Energy Law Committee. The panel was comprised of legal practitioners experienced in representing residents and municipalities in litigation and remediation involving perfluorinated compounds (PFCs). Recently discovered in drinking water supplies in the Philadelphia area, PFCs are one of several potentially harmful emerging water contaminants gaining the attention of environmental safety advocates and legal professionals. 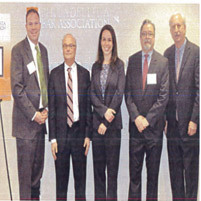 An article about the event appeared in this month’s Philadelphia Bar Reporter newspaper and can be read here.